An audience with the The Beatles! I love my music especially live music and as a frequent gig goer I was noticing more and more people recording the gig on their phones. I must admit I don’t get it, surely it would be better to just stand/sit back and enjoy the experience? Oh well each to their own. So this is my little comment on one aspect of modern life. This one colour hand pulled screen print measures 50cm x 70cm 19.6″ x 27.5″ (approx) and is printed on 250gsm art stock. Each print is signed & numbered and is strictly limited to an edition of only 300 so once they’re gone they’re gone. All my prints are designed to fit standard size IKEA RIBBA frames. Each print will be packaged and shipped in sturdy cardboard tube and posted by Royal Mail 1st class Recorded delivery which normally takes 1-3 working days. Orders outside of the U.K will be shipped by Royal Mail Tracked and Signed service which is trackable and usually takes 7-14 working days. All my prints are hand-pulled screen prints, so there may be minor variations to each print which makes each one unique and original. Because of this, the piece that you receive might differ very slightly from the photograph. Thanks for taking the time to look at my prints! If you’d like to keep up-dated on my new works, exhibitions and craft fairs just follow my Facebook page Barry D Bulsara Printworks. I am also on Twitter and Instagram @BarryDBulsara. This original artwork is copyright Barry D Bulsara 2011. Copyright is not transferable with the sale of this print. The buyer is not entitled to reproduction rights. Posted in Prints. 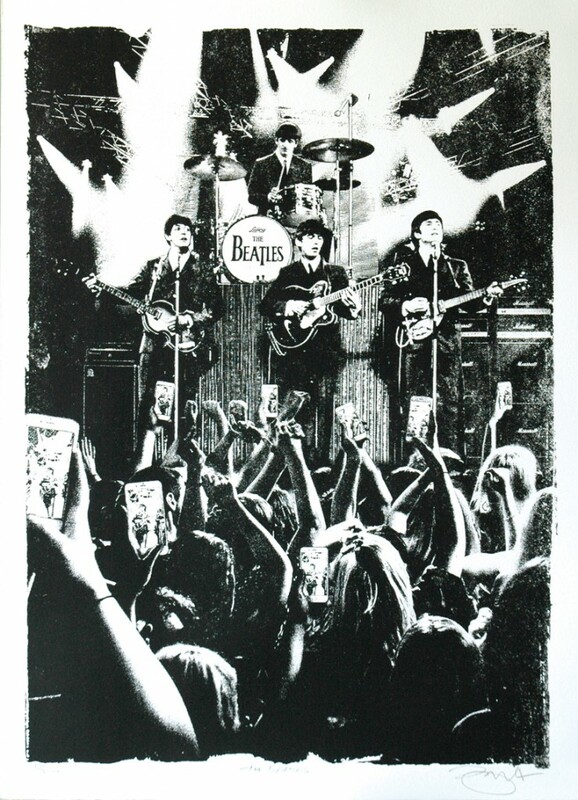 Tagged with George Harrison, John Lennon, Music, Paul Mcartney, Pop Art, Ringo Starr, Rock, Screen print, The Beatles.